Shanghai. For two weeks world leading atmospheric chemists meet in Shanghai to educate young scientists. 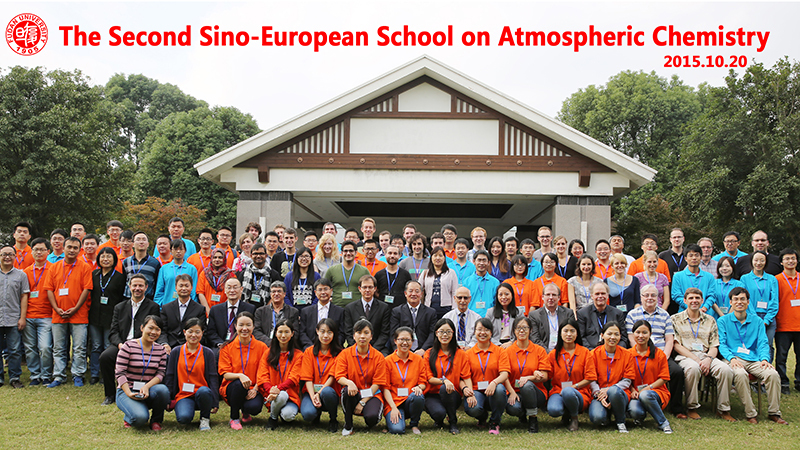 With around 100 participants the Sino-European School on Atmospheric Chemistry (SESAC-2) is one school in their field worldwide. Chinese and European PhD students and postdocs were mainly invited to second SESAC-Graduate School. Around 50 lectures by leading atmospheric chemists for example from Beijing, Toronto, Lyon, Mainz and Leipzig gave the current state of knowledge about oxidation processes in the atmosphere, mineral dust, trace gases and greenhouse gases. TROPOS participated with three lectures. The host was also in 2015 again the Fudan University in Shanghai, which is one of the leading universities of China. Prof. Hartmut Hermann of TROPOS teach there as a concurrent professor. The organizers of the school were Prof. Wahid Mellouki (CNRS Orléans, France), Dr. Christian George (IRCELYON, Lyon, France), Prof. Hartmut Herrmann (TROPOS Leipzig) and Prof. Chen Jianmin (Fudan University, Shanghai). Global change and its interaction with atmospheric chemistry is a matter of huge concern for the highly industrialized societies but also to those heavily developing like China. Indeed, air pollution in China is certainly a global issue, and not merely for the local population, but with high specificities (as a result for example of the pervasiveness of deserts, of very high emissions, etc.) on which European know-how, should fully be mobilized to reach the objective of this initiative: Training of a new generation of Chinese and European scientists to be fit to tackle the coming demands in atmospheric chemistry in the context of global change. In the last two decades it has become increasingly clear that climate change and air quality are key societal issues that have to be addressed by many scientific disciplines, which emphasizes the need for multidisciplinary education. It is therefore the main aim of the SESAC-2 summer school to help young scientists with the necessary information and provide access to state-of-the-art techniques. When considering environmental issues, the atmosphere plays a central role as a highly oxidizing medium, which is linked to the water cycle, climate and to the biosphere including human beings. Therefore changes in the atmospheric composition directly affect the Earth System through air quality, the radiation budget, shielding from ultraviolet radiation, weather events, climate and the water cycle, i.e. affecting all primary conditions for life on earth. The second Sino-European School on Atmospheric Chemistry (SESAC2) had scientifically address atmospheric chemistry basics in the 21st century as well as important current questions such as the routes for organics oxidation in the atmosphere, secondary organic aerosol formation and properties, dust physical chemistry, exchanges at interfaces (soil, oceans, etc.) and the implications to the atmosphere (air quality and climate change).